If your car’s infotainment system isn’t Android Auto enabled, fear not – it can now be used as a standalone app. You can download it from the Google Play Store. At that point it’s simply a question of giving the application access to different permissions such as calls and messages with the goal that it can play them back for you. 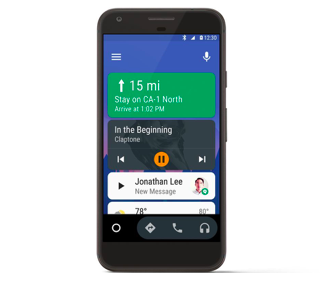 Once the app is set up, you’re given essentially a similar interface you’d generally observe on the screen of a car with an infotainment system running Android Auto. As a refresher, Android Auto gives you access to apps you may need while driving. Likely the most essential of those are music and navigation. When I installed Android Auto on my new Google Pixel, I was given a pop-up card for controlling Google Play Music and one-tap directions to a couple places I had visited. Tapping any of those brings you further into the app, while tapping the standard Android menu symbol displays a couple of more choices – mainly if you’re not in motion however. With regards to the attention on driving, not each element of the application is accessible. With music, for instance, I can get easy routes to my playlists, line, podcasts, late movement and a choice of Google Play’s “music for driving” stations. Although, I can’t simply scroll through my whole library – Google wants your eyes focused on the road. But if you do need to access more options, you can use the microphone for voice commands. Alternative cards that show up on the screen incorporate your present climate, missed calls and messages. And no, you can’t react to messages – or even read them. Be that as it may, you can have Google play them back to you. If you get a call, you’ll be given full-screen caller ID and a large button to accept or decline it. When you get a text message, you can tap another large button react with your voice or mute pop-ups. Spotify – just open that and enjoy. As with navigation, Google Maps will be your prime app but there are plans to integrate Waze in the future. With Google Maps, you can simply hit a button and find nearby gas stations, restaurants, etc. Quite convenient. Following a couple days playing around with Android Auto on my Pixel, I’m sold on this as a speedy and simple approach to replace an out-of-date infotainment system. It’s also better than spending extra money on a simple GPS system. Just be sure to have a hands-free phone mount attached to your dash or windshield to make your Android Auto experience hands-free.